This photo was taken on the Malvern Hills in Malvern, Worcestershire, UK -- a location frequented by C. S. Lewis, J. R. R. Tolkien and Sir Edward Elgar amongst others. The place is said to have inspired much of their respective works. It's a place that doesn't take long to get to from my home city of Worcester, but makes me feel a million miles away. I'd been working on a brief for a while, and despite having many concepts, I felt a little discontent. So, I grabbed my camera, got on the motorbike and ventured out. 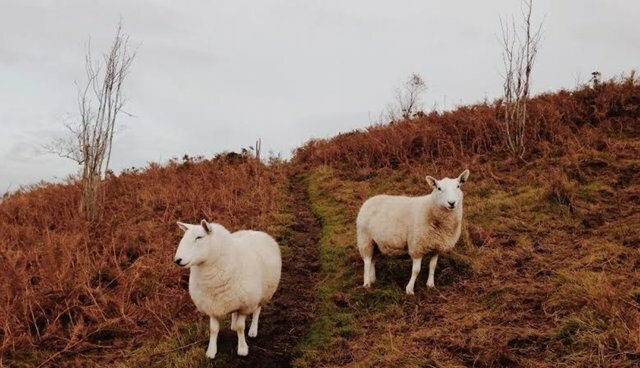 I sat with those sheep -- along with a good number of cows and an abundance of rabbits -- for hours, simply enjoying company that didn't expect anything, yet were intensely interested in me. As is usually the case, they were a little apprehensive at first. But after I'd hung around, sat in the cold as it started to drizzle rain, they started to come over and have a root around in my bag, much more confident than they'd been a couple of hours before. A walk alone would have cleared my head, but being surrounded with those animals did a lot more than that. I realized that they're interested in anything, and that's so nice. Increasingly, it seems people are only interested in things that are more and more expensive, elaborate or visually noisy. It got dark while I was still up there, as the sun was going down at around 5 pm that time of the year, but when I got home, I sat down and started that brief.